While there is nothing “punny” about the issue, I can’t contain myself so I’m going to get to the heart of the matter: Did you know heart disease is the number one killer of women. “The number one killer?” you ask incredulously. Yes, the number one killer. Heart disease kills about one woman every minute which means that just last year approximately 450,000 mothers, sisters, aunts, wives, daughters, grandmothers, and friends were taken from their families. Not only that, but did you know that 90% of women have one or more risk factors for developing heart disease? 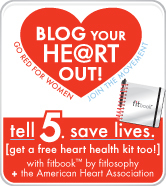 So it’s time to use the internet and social media for what they do best – spread the word, inform, and educate – which is why I’m participating in fitlosophy, inc.’s 2nd annual Blog Your Heart Out Day. Not only that, but I’m going to put my ‘towels where my heart is’ and offer a special giveaway in the hopes that you will tell five of your friends about this health risk. 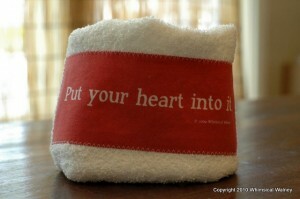 I am going to give two (2) “Put Your Heart Into It.” towels – one to keep and one to give to a friend – to three (3) people to help raise awareness about this important issue. Click the Blog Your Heart Out button on the right. Complete the registration form and join the Go Red movement. Leave a comment on this post letting me know that you completed the above giveaway entry requirements and why this issue is important to you. Feel free to share a personal story so that others can learn from you experience. For good karma points: tweet about this post, share it on Facebook, or email family and friends. Spread the word however you can and you just may save a friend’s life. This giveaway is open to residents of the United States and Canada only and fittingly, ends at midnight PST on February 14th, 2011. Please remember to include a valid email address for the drawing. I will draw the winners from the comments using a random number generator and contact them via email. The winners will have 24 hours to claim the prize or a new winner will be chosen. Void where prohibited. I just completed the registration form and invited 5 friends to do the same. It still amazes me heart disease is the leading killer among women. Though I haven’t personally experienced this in my family, I am always on the lookout for great ways to keep my heart healthy! Wonderful cause to support! This is a great cause! I went and registered and told 5 friends about it as well! None of the women in my family have had heart disease, but my father had heart problems, that lead to an early death. So I understand the devastation it came bring to families. I do believe its very important that we shine a light on the issue and help educate women on ways to keep a heart healthy. I’ve re-tweeted this blog post!Thanks again for spreading the word! Emily- It amazes me as well and I keep thinking that as long as one more person learns more about it, it makes a difference. Thank you for participating. Lauren- Thank you for sharing your story and I’m sorry to hear about the loss of your father to heart disease. We’re talking about women right now but everyone should know what to look for and make sure to eat healthy and exercise regularly. I saw your most recent weight loss post and your story is inspiring. Keep it up! I just registered. I lost 3 of my grandparents from heart-related illness. My father had a heart attack in June 2008. Thankfully he’s better than ever after an awesome group of surgeons in San Diego. I shared with 5 friends. Thank you Dana for bringing awareness to this important cause. Tried to register on Blog your heart out but could not fill out the form since it seems to be for U.S. only and I’m in Canada. Regardless, heart health is important to me because heart disease runs in my family. My dad had several heart attacks and it lead to other health complications. My dad is no longer with us, but I make a point of looking after my heart by eating healthy and through regular exercise. Jaime – I’m so glad to hear that your dad is doing well and thank you for participating. It’s such an important issue I wanted to ensure that I got the word out. Heart-related illness are often silent killers because people don’t know the signs or the risk factors. Deb – Thank you for sharing your personal story. I didn’t realize that the form was US-only as I was more concerned with getting the word out and also thinking about all of my friends in Canada so I wanted to open up the giveaway to them as well. Just tell 5 friends and we’ll call this an entry.